I finished seaming the sweater yesterday and managed to wear it during the evening as I watched TV in the cool confines of my basement. It fits perfectly and the cotton feels really nice. It is a bit cropped, but I would probably wear something underneath it. 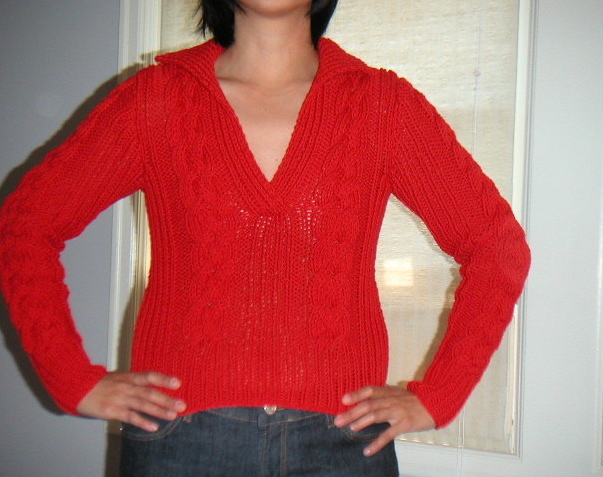 I also love the open vee neck and the collar. Aside from the miscalculated cable instructions, I would definitely recommend this project. It was a quick and fun knit!